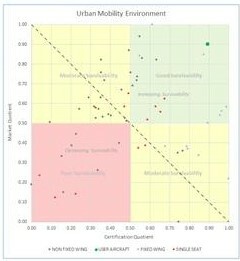 We have developed a tool for risk analysis for Aerial Urban Mobility Concepts and have ranked the Top 5 design concepts using this unique risk analysis method. The spreadsheet tool and white paper are made freely available from our website here. At the start of any technological or market revolution, there is an evolutionary explosion of ideas and concepts. This can be conceptualized similarly to the Cambrian Explosion of 541 million years ago. Over time the many genetic variations are naturally selected until only the variations that naturally suit their environment or are able to adapt to their environment survive. This effect can be observed to a lesser or greater extent when any technological breakthrough is developed in a relatively free market. Phase 1: Many organizations will evolve many different designs which will be tested in the market and regulatory environments. Over time different archetypes made by several manufacturers will survive the natural selection process. Phase 2: In the long term, these organizations will grow their market share, reduce in number through consolidation and will stabilize as two or more large organizations. These two phases can be characterized as ‘Conceptual Cull’ and ‘Corporate Consolidation’. This white paper is concerned with the ‘Conceptual Cull’ phase. This paper is not entirely scientific in nature. Where possible empirical assessments are made. These assessments are combined with the informed experience of the author and the reviewers in order to draw rational conclusions. This white paper is not intended to be a criticism of any single concept or any single company. This paper is not concerned with technical feasibility and for the purpose of this study, it is assumed that all of the designs reviewed are technically feasible.